Duck Dynasty stars are entering the children’s publications sphere with a picture book, Everything’s Better With a Beard. Publisher Simon & Schuster will release Everything’s Better With a Beard in March 2014. The photographic picture book has a simple message: Slap some facial hair on everything -from rubber duckies to sunflowers to trucks – and it’s instantly better. 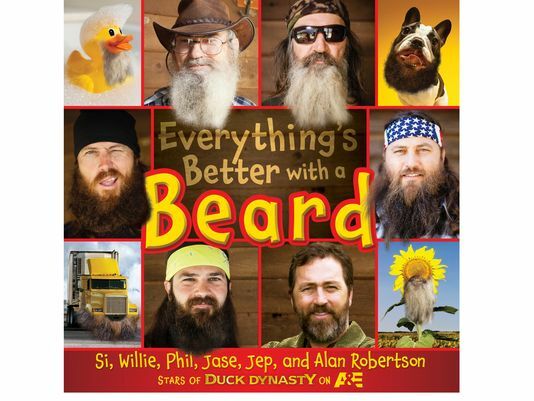 Everything’s Better With a Beard, written by Si, Willie, Phil, Jase, Jep and Alan Robertson, will be full of homespun Duck Dynasty wisdom that kids will love. “Kay has set up a special section in their house for all the grandchildren that is filled with children’s books,” Willie Robertson said in a press release.